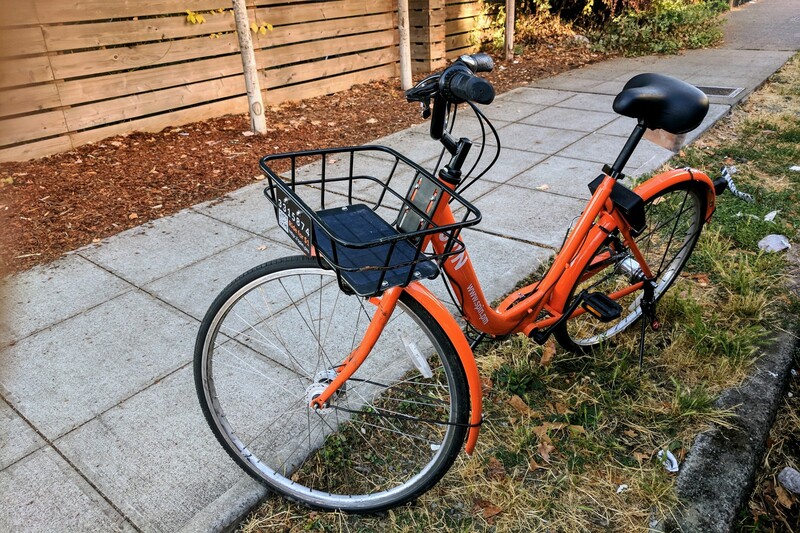 Recently three new bike sharing players popped up in Seattle, after Pronto failed, and was bought by, and shortly after dumped by the City of Seattle (yeah I know, it’s a weird story). Scattered around the city you find orange bikes from Spin, lime-green bikes from LimeBike and then there is Ofo branded in yellow of which I haven’t spotted any yet. Both Spin and LimeBike are companies from the Bay Area while Ofo is Chinese. A fourth player, VBikes will be launching soon. It’s odd to see so many bike sharing companies launch at the same time. Where were they all these past years? The difference between these ‘dockless’ bike services and the failed Pronto is that they don’t work with designated bike stations. Meaning you can pick up and leave these bikes where-ever you like, just like you do with Car2go or Reachnow for cars. Additionally there is no longer a requirement for these services to offer a helmet, which some people believe was part of the failure of Pronto. I recently tested both Spin and LimeBike and would like to share my initial impressions. I started out with Spin. I downloaded and fired up the app, opened up the map and walked towards the closest bike located near the Community College in Capitol Hill. Upon arrival I hit the ‘scan’ button to scan the QR code at the back of the bike but unfortunately the app crashed on me twice. I then decided to manually enter the bike’s number but also that didn’t work (unable to focus on input field, unable to enter anything). Scanning QR code of Spin bike. Update: Weeks later the scanning problem (on the latest Android version) is still not resolved. It takes several attempts and app re-starts to be able to scan. Additionally I have never been able to enter the bike’s number. Where is this Spin bike!? I was a little annoyed having to enter my credit card details in the middle of the street. In my opinion this step comes at the wrong time in the flow. This is a small on-boarding annoyance, but it did create yet another frustration after the other hurdles I already had to go through. Anyways — enough whining — I hopped on the Spin bike and biked towards Seattle Center to attend some free hipster concert where they were handing out free coffee and Cliff Bars. Spin’s bike felt clunky. The brakes were squeaking, switching between the three gears wasn’t very effective (the lowest gear wasn’t low enough) and often the chain/gears would loose grip when biking uphill. Also the front wheel’s alignment was off and some parts were rattling. Overall this felt a cheap bike and I didn’t feel very safe given the squeakiness of the brakes. But it did get me to my destination. A bunch of Lime bikes at Capitol Hill Lightrail station. Some time later I decided to try out LimeBike. 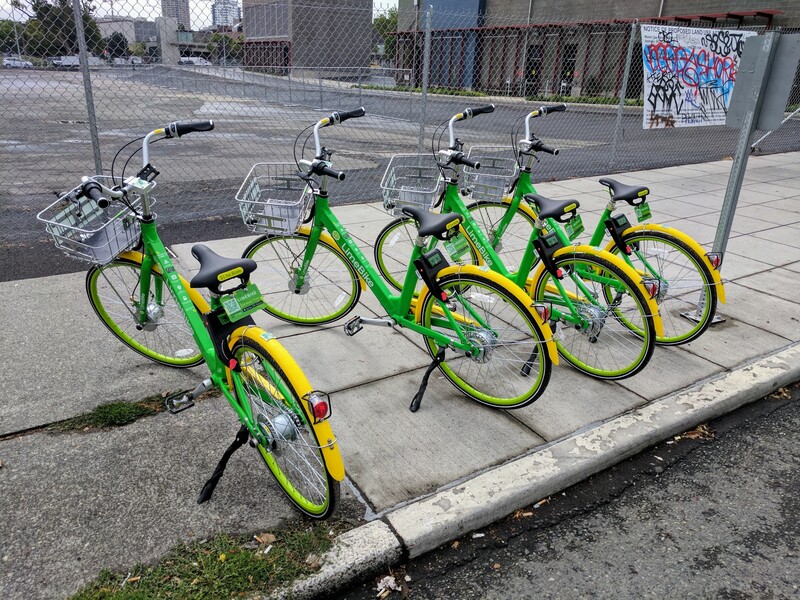 Using LimeBike’s app I located a whole bunch of bikes near the Lightrail station in Capitol Hill. I walked up there and spent fifteen minutes trying to find them. 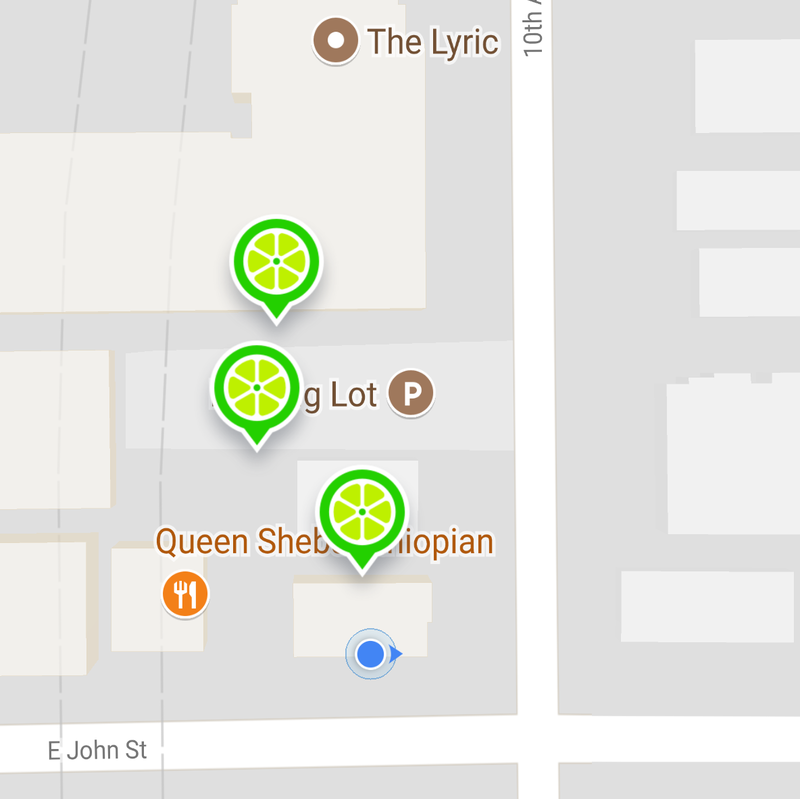 According to LimeBike’s map these bikes were scattered across a private parking lot of a condo building, but I couldn’t find any. I tried to report this by clicking the specific bikes in the app, but unfortunately there isn’t such a feature, so I couldn’t report that these bikes may be parked on private property. Instead I hit the help button trying to share the below screenshot, but sharing a screenshot wasn’t possible through their help form either… :/ Uh! A little frustrated I moved on, trying to find the next batch of Lime bikes. I finally found four, nicely parked next to each other (see image above). Were these the bikes I was originally looking for? Did someone move them? Or was their location off? 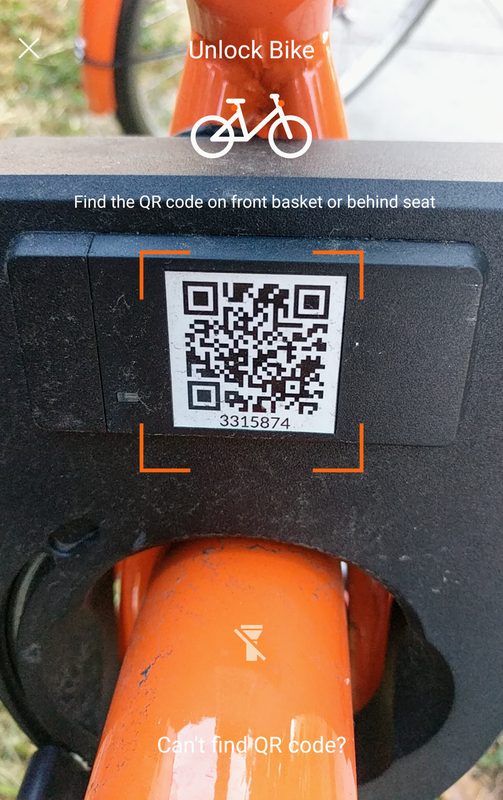 Anyways, I scanned the QR code of one of the bikes and hit off. Surprisingly I didn’t have to enter any payment details at this point, so I didn’t had to fiddle with my credit card on the street. Hopefully they send me an email once I reach the limit of my free rides and I can conveniently enter a payment method while on my computer. 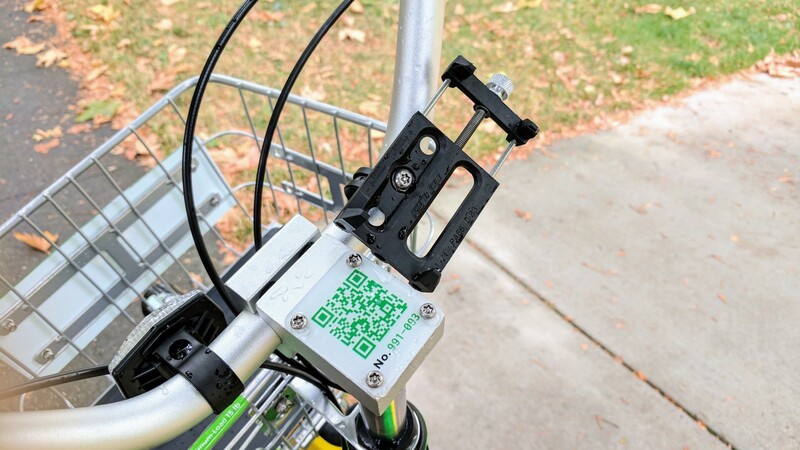 Update: Upon scanning a LimeBike for my return trip, I was asked to provide payment details, something they could have asked right after my first ride (by e-mail or in-app message). This would have allowed me to enter payment details whenever I felt convenient to do so. I really didn’t like having to enter payment details while standing on the street. It came unexpected and was ill-planned. When I decide to grab a bike I need to go places. At that point, it’s the wrong moment to ask for payment details in my opinion. 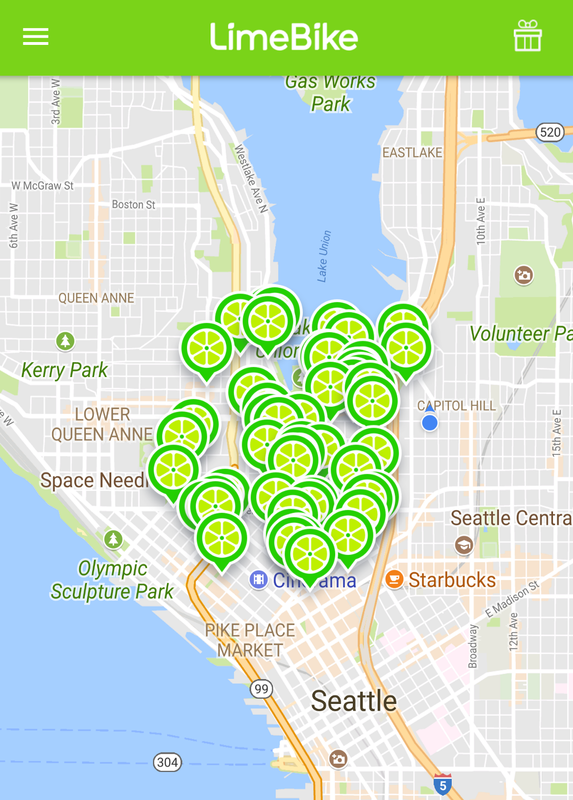 The ride with LimeBike— this time from Lightrail station to Union Coffee — was pleasant. Lime’s bikes have a whole lot more gears than Spin’s bikes. Plus, there is a handy smartphone holder on the bike which I successfully used to navigate. Obviously offering a universal smartphone holder is quite a challenge, so it was appreciated it was available in the first place. While testing Spin bike I held my smartphone in my hand for navigating, which is challenging while riding on Seattle roads. Believe me, you don’t want to be riding like that. Fun statistics after a ride! A fun and unexpected experience with Lime bike was the audible feedback when unlocking and locking the bike. Additionally when arriving at my destination I was surprised to see statistics that were collected during my ride, like burned calories (I must admit I could have burned more calories because I ended the trip earlier than expected to continue walking because it was too steep). The app also shows your carbon footprint, but it’s a little unclear what that means. Is this the carbon dioxide generated by breathing out? Or is this the carbon dioxide I did not generate by not using a car? Overall riding LimeBike was a much better experience than riding a Spin bike. Next time I need a bike I’ll check LimeBike first. It’s highly advised to use Google Maps when planning on biking somewhere in the city. The reality is that there are a lot of crappy roads in Seattle and the majority without dedicated bike lane. After all, this is an American city and they don’t care — or at least they didn’t in the past — about bikers. There is still a lot of catching up to do. Yes, you are right, this statement comes from a European living in Seattle. Many Seattle roads have been damaged by construction or tree roots and there are a lot of pot holes, cracks, steel plates covering pot holes, tram tracks,… making it a pretty rough ride (especially when holding your smartphone in your hand on a Spin bike) and it’s not even the rainy season yet! Before hopping on that bike I recommend to plot your route with Google Maps which takes bike lanes and elevation into consideration. Elevation is the biggest hurdle if you don’t consider biking as part of your fitness routine or if you want to make sure you don’t arrive sweaty at your first date or first day at work. Luckily Google Maps has an experimental feature showing the elevation of your route which I will start using to determine whether I should go by bike or car (using Car2go or Reachnow of course, who still owns a car nowadays!?). The above elevation chart by Google Maps shows the elevation change from Seattle Center to Union Coffee. As you can see you have to climb 354 feet and will go downhill 187 feet. Climbing 354 feet is no joke! The reverse of this route is doable but for biking wimps (like me?) I would think twice before biking this route. Any alternative transportation method is highly welcomed. At the end it’s a mixture of transportation means (bike, car, taxi, bus, Lightrail, Amazon/Microsoft connectors) that wins. I can see myself biking towards a Lightrail station to cover the last stretch. Or bike towards a Car2go or Reachnow car when they’re parked a little further. My only concern is the sudden elevation changes. Seattle is by no means a flat city and going uphill is pretty challenging. On my last trip I had to step down twice to walk uphill. Maybe there should be an offering of electrical bikes? Or should I go work on my condition instead? In terms of comparing Spin with LimeBike, LimeBike is the clear winner in terms of overall experience. Their quality of bikes is higher and their app works. Spin is still very rough around the edges, but I’m sure they’ll iron these kinks out soon. And Ofo… well, look at the map in the beginning of this article, there are only three bikes available in Capitol Hill, not sure where the rest is hiding. The above map of Ofo was screenshotted at 12pm. Do Ofos go to sleep at night? Or maybe they’re being redistributed? 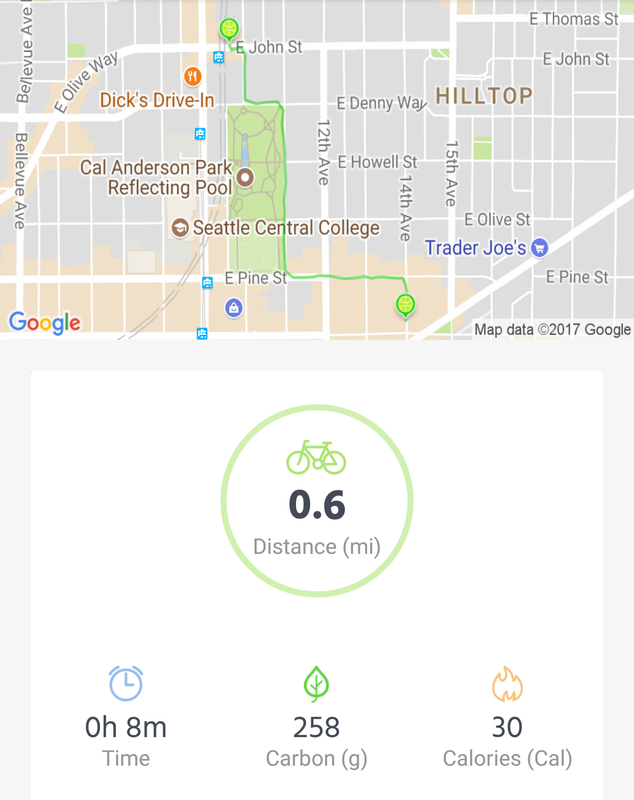 Both LimeBike and Spin failed in accurately locating available bikes. That should be their #1 concern. Car2go suffered from this as well upon launch in Seattle a few years ago, so maybe they should go pick their brains. Topographic map of Seattle showing the area where all bikes end up by the end of the day. Another challenge are the huge flows, which Car2go also suffers from. After 6pm all Car2go cars are gone from Downtown and located in the surrounding neighborhoods. After 9am you see the reverse; all cars are Downtown, surrounding neighborhoods have little to no offering. That’s because people use Car2go to commute to work and most jobs are in Downtown. 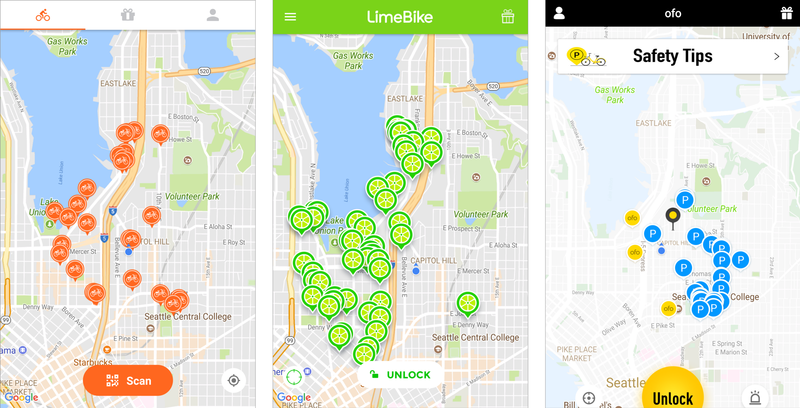 The map to your left — generated by LimeBike at midnight — shows that all bikes (besides one) are located in South Lake Union (aka “Amazon land”). Spin’s map shows a similar trend. That’s not because Amazon is handing out free bananas in the middle of the night, but probably because that’s the lowest point in Seattle if you look at the above topographic map. West of the bikes lays the much higher Queen Anne, and east you have Capitol Hill. South of all the bikes is Downtown which is pretty flat, but there is little reason to end up there at the end of the day. Conclusion, people mainly use bikes to go downhill. No sh*t, Sherlock! Both Spin and LimeBike received a copy of this write-up so they can use this feedback to improve their service.